Save a stack on these quality art supplies just in time for Christmas. No matter how invested you may be in your high-end digital workflow, you can't beat some actual sketching or ink drawing with proper pens and pencils. And right now there's a great excuse to stock up on art supplies, with Amazon dropping the price of a bunch of Faber-Castell pens, pencils and pastels as part of its last-minute Christmas deals. So whether you want to add your own pen collection or get some cheap Christmas gifts for creative chums, there's bound to be something for you here. 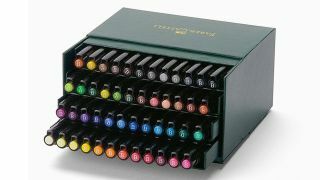 What's particularly caught our eye is a gift box of 48 Faber-Castell Pitt Artist Pens. Designed to give you all the advantages of India ink in a modern pen, these artist pens feature high-quality brush points that work both straight and bent, and deliver a reliable, even flow of brilliant pigments with excellent light-fastness. Loved by Manga artists and ideal for graphic artists, designers, illustrators and architects, these Pitt Artist Pens are suitable for drawings, plans, lettering, layout work and more, and with 48 colours to work with you'll always be able to find the right tone. Right now you can get this gift set from Amazon for just £76.85, knocking £57.05 off the usual price of £133.90, and there are plenty more Faber-Castell deals to be had at the moment; read on for more.